Home > Law Books > Treatises > Corporate Counsel's Guide to Independent Contractors, 2018 ed. 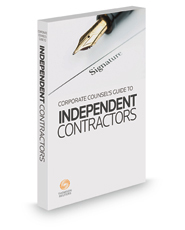 Corporate Counsel's Guide to Independent Contractors, 2018 ed. Not only does this title cover the rules in all of these areas, it also includes the cases and agency determinations to show how these rules have been applied.